March 16, 2013, starting from $3449. Begin in Stresa, on the shore of Lago Maggiore • Visit a wine shop and enjoy a cocktail party, tasting some local products • A boat transports you to your welcome dinner on Isola dei Pescatori, the most picturesque of the Borromean Islands. Today dinner will be included. Today you choose how you want to spend your day in Stresa • Cruise on scenic Lago Maggiore past islands, villas, historic palaces and visit the impressive Borromean Palace* • Or visit an ancient village nestled in the mountains, where you stop at a local farm to sample their artisanally-produced cheeses paired with the region’s delicious wines • Your evening in Stresa is at leisure • Investigate the piazzas, flower-lined cobblestone streets and lakeside promenades. Today breakfast will be included. Learn key Italian phrases that will help you in your travels • Depart the lake region for Sestri Levante on the Ligurian coast • Stop at Lake Orta and take a boat to Isola di San Giulio • Walk the grounds of this charming island with its working convent • Experience the outdoor cafes and shops of this lakeside resort • Continue on to the Italian Riviera! Today breakfast and dinner will be included. Travel to the seaside town of Santa Margherita Ligure for a boat ride** to glamorous Portofino • Take in the town’s colourful harbour, dotted with fishing boats and yachts set against a backdrop of pastel-coloured buildings • Continue to the Cinque Terre • Travel by rail through the villages of the Cinque Terre • Traverse the rugged coastal area dotted with terraced vineyards • Arrive at this nearly inaccessible string of fishing villages tucked between the mountains and the Mediterranean • Enjoy an afternoon exploring. Drive to the medieval city of Lucca, encircled by 16th century Renaissance walls • Tour the piazza on foot • Visit the Cathedral of San Martino and the Piazza Napoleone • End the day in a traditional Tuscan villa • Begin a relaxing four-night stay***. Get to know Florence via its local market full of fresh ingredients used in Tuscan recipes • Take a walking tour of the city’s treasures and monuments, including the Piazza del Duomo, centre of religious life in medieval Florence, and the Piazza della Signoria • Visit the Museo della Casa Fiorentina Antica, housed in the 14th century Palazzo Davanzati • Explore independently before returning to your villa • At dinner, sample Tuscan cuisine in one of Tuscany’s locandas. Travel to Siena for an expert-led walking tour through narrow medieval streets that include the dramatic cathedral • Visit the hilltop town of San Gimignano, punctuated by tall medieval towers which afford spectacular views • Return to your villa this evening. Visit a winery in the heart of Tuscany that showcases the wine cellar, family estate, vineyards and olive groves • Participate in a Tuscan cooking lesson given by the winery’s own chef • Enjoy an authentic Tuscan lunch, expertly paired with wines produced on site • Return to the villa for some leisure time. Today breakfast and lunch will be included. Depart for Venice • Stop en route in Bologna • Take a guided walking tour of the centre, virtually unchanged since the Renaissance • Sample local delicacies at specialty food shops • Arrive in romantic Venice for your two night stay. 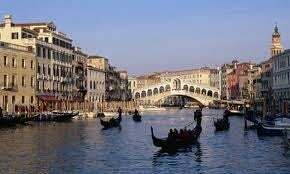 Enjoy a boat trip**** to Murano Island for a fascinating glass-blowing demonstration • Return to St. Mark’s Square for a locally-guided walking tour featuring the Clock Tower, St. Mark’s Basilica, Doge’s Palace and the Bridge of Sighs • Partake in a celebratory farewell dinner. NOTE: Tour prices are land only rates based on per person, double occupancy. Some dates may feature various changes in hotels, sightseeing and inclusions. Please confirm your specific itinerary at the time of booking. Government taxes and fees are additional. Land rates are guaranteed at time of deposit. Certain taxes and fees are to be paid upon exiting the country in local currencies. Airfare is available at an additional cost. PLEASE NOTE: Single accommodations are limited and are available on a first come, first served basis. Please note that most shops and businesses in Italy are closed on Sundays and on national/religious holidays. Most national museums in Florence, including the Uffizi Gallery and the Academy, are closed on Mondays. To complete your vacation, we include roundtrip airport-to-hotel transfers when purchasing Explorations airfare with your tour. Hotel check-in on your day of arrival is 3:00 PM. Rooms may not be available prior to that time. In order to fully experience the destination, some of our hotels on these programs are located in smaller towns or on country roads where access is limited to large coaches. In these cases, you will be dropped off as close as possible and there will be a short walk to access the hotel from the drop off area. *When the Borromean Palace is closed in colder months, another attraction will be visited in its place. **The boat ride to Portofino operates on a weather permitting basis. When the weather is uncooperative, you will still visit Portofino, but you will travel there by bus. ***Note that villas in Tuscany are dotted throughout the region and we use different properties on this program. Some may be located in the countryside, removed from a city center. Still others may be closer to the hustle and bustle of the region. Each one is unique, full of history, with many amenities, and brimming with true Tuscan flavor. This is part of the fun! ****On occasion, due to inclement weather, your boat trip to Murano Island may be substituted with a visit to a local glass factory in Venice.